“It hurts to lose one of these trees.” Those are the words of a Ladd’s Addition neighbor who is living with an empty space in front of his home due to Dutch elm disease. Ladd’s Addition experienced elm loss again this summer in the areas near Ladd & Lavender and Abernethy Elementary School. That’s not unexpected. In addition to transmission by the bark beetle, DED can spread via the root system of side-by-side trees, so adjacent trees are most susceptible. Roots can even spread under the street to affect trees in the opposing parking strip. Inoculation. SOE’s inoculation program has been successful in limiting annual elm losses to an average of 2 to 3 % of the grove. Pruning. 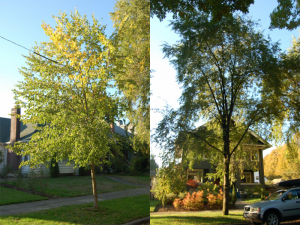 SOE negotiates discounted American elm pruning pricing for homeowners. It’s essential to remove dead branches to stem disease. Planting. SOE has planted 687 street trees – elms and many other species – in Ladd’s Addition since the organization’s inception In fact, SOE has planted almost 45% of all the trees in Ladd’s since 1986! We are working to add another preventative measure to our tool kit. SOE has been talking with the City of Portland to gain approval to trench the soil between elms. Trenching eliminates root grafting between adjacent trees to decrease the spread of DED. We hope to have approval soon. Thankfully, the void left by lost trees doesn’t last for long. The disease-resistant elms that SOE plants each spring grow at an impressive average of 15′ in just five years and almost 40′+ in 20 years. Young elms are typically at least 6′ tall when planted. Here are examples of elms planted in Ladd’s in recent years. The elm on the left was planted in 2006, the elm on the right in 1990. Please make a tax-deductible donation to Save Our Elms today as so many of our neighbors do every year. Help fight the void! One hundred percent of your investment is used for SOE tree protection and planting efforts. 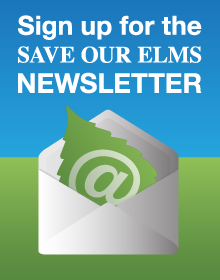 Please send your check to: Save Our Elms, 1630 SE Elliott Ave., Portland, Oregon 97214. Thank you for your support.